Google has updated its Maps for Android application, giving it more GPS navigation features than mobile offerings from Apple and Microsoft. One key new feature in Google Maps 5.0 for Android is that the map moves with the user. Most mobile-phone maps stay oriented to the North, even if a user is moving in another direction. Users of the new Google Maps can hit the compass icon in the top corner of the map and the map will automatically rotate to face the same direction as the user. Words on the maps will also rotate to be readable by the user. That feature isn't available on the iPhone map or on Microsoft's maps, either on Windows Phone 7 devices or the Bing app for iPhones. Google has added some other features that make the application useful as a GPS navigator. Google has started caching maps that users look at most often so that when a user wants to view a map in an area without an Internet connection, Google can still display the map. Google does the caching overnight when the phone is plugged in and connected to Wi-Fi. Not only can users view maps when not connected to the Internet, they'll get refreshed directions if they take a different route than the one the map initially suggested. Users will have to be connected to start a route, but if they get disconnected midway, the software will reroute them if necessary. Google has added some other neat features. Dragging down on the screen with two fingers tilts the maps. If a user is in one of the 100 cities for which Google displays 3D renderings of buildings, those images will pop up. Google says that the changes it has made on the back end to enable these features end up saving users in data usage. It estimates that viewing the maps requires 70 percent less mobile network data than previously. Not all Android users will get the new features. 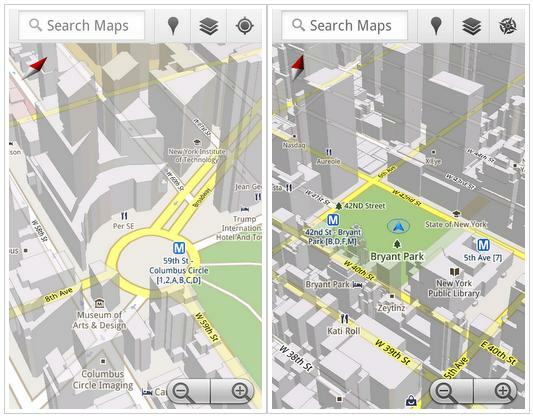 Maps 5.0 works on phones with Android 1.6 and higher, but the 3D and offline features require Android 2.0 or higher. Just over 93 percent of Android phones are running version 1.6 or higher and 83 percent have version 2.0 or higher. The updates may encourage some people to use Google Maps instead of buying a third-party GPS navigation app for their phones. Google's announcement comes a day after Microsoft rolled out some improvements to its Bing Maps for mobile offering. Starting this week, Microsoft will roll out the update, which includes adding Streetside to the mobile version. Streetside stitches together photographs and overlays them on the map. The updates, which also include features that let users book restaurants and do other things in the maps app, will be available to iPhone users of the Bing app. Some of the updates will be available to Android users as well.